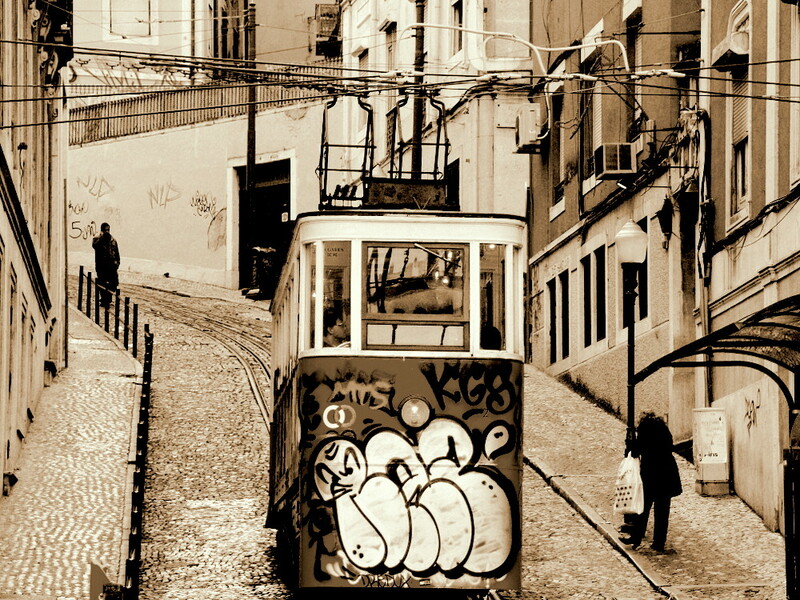 The Glória Funicular (Portuguese: Elevador da Glória) is a funicular that links Baixa (Restauradores Square) with Bairro Alto (Jardim / Miradouro de São Pedro de Alcântara), in Lisbon, Portugal. It is operated by Carris. The Glória Funicular was opened to the public on October 24, 1885. At first it was designed as a water-powered system, then in 1886 it was replaced by a steam-power one, and finally in 1915 it was electrified. In 2002 it was designated a National Monument. Я думала, это старый трамвай Очень живописный фуникулер! Интересное фото. Хотелось бы внизу немного открыть кадр. I hope you like this one... in color!!! All this zone of Lisbon is very old and very beautiful too! It's really a wonderful city!!!! A big hug from Lisbon, my dear!!! Thank you for circumstantial commentary! The Original tax photography! Alisa. Interesting approach, excellent color! Moments surprised, remarkable history of the Tramway, congratulations!